Researchers from the Sleep Team at the Lyon Neuroscience Research Center (CNRS/INSERM/Claude Bernard Lyon 1 University/Université Jean Monnet), together with a colleague from the MECADEV research laboratory (CNRS/Muséum National d'Histoire Naturelle) have confirmed that lizards exhibit two sleep states, just like humans, other mammals and birds. 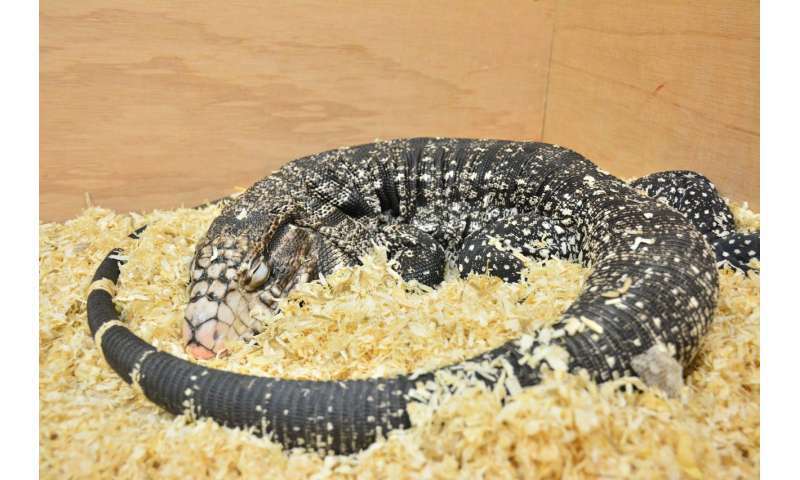 They corroborated the conclusions of a 2016 study on the bearded dragon (Pogona vitticeps) and conducted the same sleep investigation on another lizard, the Argentine tegu (Salvator merianae). Their findings, published in PLOS Biology, nevertheless point out differences between species, which raises new questions about the origin of sleep states. During sleep, the body carries out many vital activities: consolidation of knowledge acquired during the day, elimination of metabolic waste from the brain, hormone production, temperature regulation, and replenishment of energy stores. It would appear that this physiological phenomenon is shared by all members of the animal kingdom, and has been preserved throughout evolution. But scientists long thought that only land mammals and birds experienced two separate sleep states: slow-wave sleep and REM sleep. The latter, associated with dreaming, is a complex phase during which the body exhibits behaviors in limbo between those of sleeping and waking hours. A study the findings of which were published by Science in 2016 focused on the bearded dragon (Pogona vitticeps) and demonstrated that this lizard also entered two distinct sleep states. It further hypothesized that such sleep states originated in a common ancestor of mammals and reptiles 350 million years ago. These differences observed by the researchers paint a more complex picture of REM sleep in the animal kingdom and open new doors for investigations into the origin of our own sleep patterns and dreams, and those of lizards.